Islam Around Us: Escape from Taliban' author shot dead in Afghanistan. Escape from Taliban' author shot dead in Afghanistan. 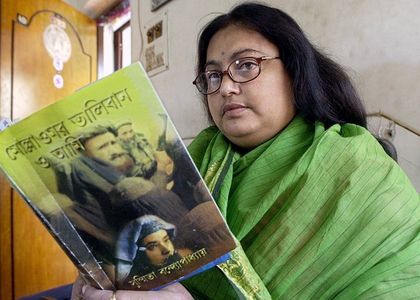 KHOST | Afghanistan | 06 Sep 2013 :: An Indian author whose story was told in the movie "Escape from Taliban" was shot dead after returning to Afghanistan to make a documentary about women, police said on Friday. The killing of Sushmita Banerjee, 49, on Wednesday was the latest in a series of attacks on women in the conservative Islamic country, adding to concern that hard-won women's rights are eroding ahead of next year's withdrawal of most international forces. The Afghan Taliban denied involvement. Banerjee, who told her story of life under the Islamist Taliban in "A Kabuliwala's Bengali Wife", was dragged from her house in lawless southeastern province of Paktika and shot as many as two dozen times, police said. Her body was found on Thursday morning near an Islamic school about three km (two miles) from her home, Paktika police chief General Dawlat Khan Zadran said. "Gunmen entered her house at 11 p.m. on Wednesday, took her out and shot her dead," Zadran said, adding that he suspected Taliban involvement.